The intrepid kelpie Katie barked her last about noon o’clock on September 13, 2011, letting the vet who had kindly come to relieve her of her suffering know that she was The Kate, boss dog of all she surveyed, the one creature on earth solely responsible for the well being of two hapless bipeds and that in the name of all the gods and goddesses who had ever dared to lay claim to this lost planet, she was not about to go gentle into the great cosmic void, even though she had been telling those same two bipedal klutzes that her time had come, her spine was failing along its entire length and her pain was constant. Her eyes had the unfocused distant stare of an animal waiting for death. When she did move, which was seldom, she propelled herself as fast as she could in an inevitably doomed effort to keep ahead of her failing hind legs, and then sprawled on the floor, she would look shocked and betrayed. After one particularly rapid propulsion across the room the night before her death, she stood by me and gave a plaintive whine/yelp, call it a ‘welp,’ indicating clearly that she wanted to go. And so she went, her head in my lap, with Gina stroking and soothing her, and telling her as the anesthetic took hold that she could finally rest, that she would look after the old klutz. I had told Gina the night before, after the Kate’s welp, that she would on principle not go gently. That was not in the nature of a dog who had only two speeds--naught and ought, i called them, zed to flatout with nothing between--but was also capable of the most carefully calibrated maneuvers. She routinely ‘matrixed’ walls for six or ten feet at a stretch and once performed a three-foot vertical jump from a stand still to the top of the back of a sofa and then walked five-feet along it before sliding down next to me, couch bound with a fractured femur. For all her athleticism, or perhaps because of if, she needed to be engaged, primarily with people, other dogs being more hindrance than accomplice to her games. Tennis ball for the Kate was an exercise of acrobatic precision. She loved running under the long throw and catching it over the shoulder, then pausing so that her audience might appreciate her skill--and invariably there was an audience, including people who ordinarily wanted nothing to do with dogs in the park. She would enlist individuals in her game, dropping her ball at a person’s feet and backing up, eye on the ball, barking if they were too slow by her measure to understand that they were to throw the ball. The Kate abandoned those who threw poorly while favoring those with canons for arms. If she dropped a ball, she would race it back to the same thrower and demand that they repeat the throw until she got it right. When arms failed or the heat was too great for running, she would engage in short order drills, displaying reactions to make the best shortstop envious. At poolside, she would wait, poised until the ball was tossed gently in a high arc over the water and then leap for the catch, twisting, tucking, turning to grab it before she hit the water. It will doubtless be said that such contortions stress the spine, contributing to problems of the sort that beset the Kate late in her lfe, but then she would have been denied an activity she loved that helped keep her in excellent physical condition. The Kate recognized no inside or outside if there was a ball to be had. 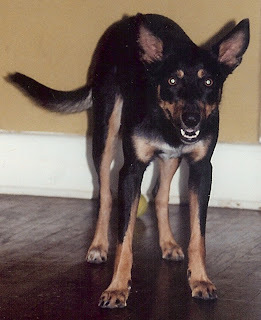 We routinely warned visitors not to engage the Kate with a tennis ball unless they wanted her to plague them the whole time they were present--or until they begged for mercy. We emphasized that when we said don’t touch the ball, we meant with any part of their anatomy. The warning was expansive, because the first time we warned guests to avoid playing ball with Kate, no matter their instincts, she unveiled a new game, she brought the ball to the most dog phobic guest, the one who had ignored her most assiduously and carefully positioned it on her chair so that it touched her leg while succumbing to the pull of gravity. She waited for the ball to hit the ground before returning it to the same person and repeating the process until she relented and rolled the Kate the ball and then did it again and again with obvious pleasure. The game became a part of the Kate’s repertoire. She had a special appeal to the disaffected, a capacity for engaging them in order to please herself. For thirteen-and-a-half years the Kate shared our lives. She arrived as a nine-week-old puppy, named Katie, a gift from a rancher friend in Texas who thought she was a little short in the wheel base to handle the 1,000 pound steers he ran on his ranch. She entertained, amused, sometimes aggravated but always engaged and amazed us. The diminutive faded from her name. Kate was the last one standing of the six dogs we have had in 30 years together--and the eleven I have had in my sixty plus years. Each of them was unique, including the one who was neurologically miswired to the point of self-destruction. I would be hard pressed to say that Kate was the best of them, although she was the most brilliant and the best athlete, but my relationship--I dare say, our relationship--with her was subtly different for a host of reasons that boil down to one. She was The Kate. She is emblematic of them all. So sorry to hear about the Kate. Everything I've read that you've written about her has revealed her as a truly special dog. I loved reading about the tennis ball game and how she used that game to impress that young man. Most people don't really get to see true canine genius at work. Our culture just isn't into it. When the dogs I've loved have passed on, I continue to miss them for years and years. I never really get over it. I just learn to cope without them. Two continue to haunt me in nearly everything I write. that' was a really nice dog !!! Via a news video, I happened upon your farewell to The Kate. And I thank you so much for your thoughts and words that gave me some "comfort” in that I have a “tribe” of like hearted people who share a loss. We just lost our Kayla - warrior, athlete, pal, neighbor to all... You describe our Aussie, our thoughts and feelings of myself and husband (early 60’s) almost exactly. Kayla passed away Oct 27, 2011 - just turning 17 years. Our most favorite vet (who took care of after hour emergencies over the years) at 10:30 PM – helped me say good bye to the best dog anyone could ever want. Kate’s last days were so similar to our Kayla’s and the vigilance we kept around her waiting for her nod to let us let her surrender. We will sorely miss her. And thank you to Retrieverman for the poem to keep. I will add it to our Kayla mantel.